The term of suicide is too broad and too vague. The definition and risk for suicide-related behaviors, that including self-harm, threats, attempts and suicide, remain unclear. In addition, whether paternal or maternal bonding plays an important role in suicidal attempt and threat is unknown in Taiwan. Hence, this study aimed to find out the relationship between different parental bonding styles and suicidal attempt and threat, and the predictive index for suicidality was also investigated. Total of 422 participants with suicidal attempt and 356 who’s with suicidal threat, which referred from all Health Department clinics and hospitals in 33 townships of Pingtung County in southern Taiwan, were recruited. In addition, 299 controls were random sampling from the community in 33 townships of Pingtung County, and who’s without any psychiatric diagnosis history. After adjustment for socio-demographics, both paternal and maternal “affectionless control” had significant associations with suicidality. When demographics and depression was adjusted, only the paternal “affectionless control” remained significantly associated with the suicidality. Furthermore, personality characteristics, alexithymia, and mental disorders as the mediating factors between parental affectionless control and suicidal attempt or threat are shown. In conclusion, paternal and maternal “affectionless control” might be used as the predictors for suicidal attempt and threat in Taiwan. Particularly, the impact of paternal affectionless has contributed to suicidal attempt through neuroticism than threat. These models may provide the references for clinical implication. Different preventive program and model might be considered in different type of suicide behaviors. Suicidality has been considered one of the serious public health issues worldwide. It may have a number of different proximal precipitating and distal predisposing risk factors, which include genetic backgrounds, parental bonding, personal characteristics, and mental health problems, are related to increased rates of suicidality [1,2]. Particularly, poor parental bonding seems most at risk for suicidality [3-9]. Suicide is defined as a self-injurious behavior of intentionally terminating one’s own life [10,11]. Actually, the terms of suicidality, also referred to as suicide-related behaviors or suicidal behavior, include types of suicide-related ideations, suicide-related communications (like suicide threat, suicide plan), and suicide-related behaviors (like self-harm, suicide attempt, suicide) , and some of them are difficult to clearly distinguish. Suicidal behaviors are major public health priority, and are probably caused by interactions of several different factors, that involving biological, genetic, environmental, psychopathology and sociopolitical risk factors . Most studies explored the risk factors of suicidal ideation/thoughts, because of which may cause the behavior of suicide in the future; while a few studies focused interest in suicidal threat. However, the psychopathology of suicide behavior were often considered in the previous studies, the definition of suicide always describe unclear. Particular, the definition of suicidal behavior, deliberate self-harm, suicide-related behavior, and suicidality remain easily confused . The terms of suicide has especially resulted in a lack of clarity and precision in scientific literature, clinical, research and epidemiology . Different disciplines have different needs for their understanding and prevention of suicide. Even that, it is necessarily to understand the term of intention to die and preparation to die for distinguishing either acute or high risk for suicide. Based on O’Carroll et al. and Silverman et al. [12,14], the term of suiciderelated behaviors, that including self-harm, threats, attempts and suicide, have been classified in Figure 1. A uniform set of criteria and definitions offer constitutes “intent to die” will determine how many questions need to be asked and how much exploration will be required to determine its presence. It is virtually impossible to distinguish between types of suicide-related behaviors and other self-injurious behaviors, without the inclusion of intent [12,14]. Figure 1: Suicide-related behaviors (has been modified based on the O’Carroll et al. (1996) and Silverman et al. (2007)). In previous studies, there were arguments for the relevance of parental characteristics. Hinde  noted three principal dimensions that have been described as dominance/subordinance, love/hate, and involvement/detachment. It was corresponded to a three-factor solution-authoritarianism, parental warmth, protectiveness, which have been suggested by Murphy and the colleagues . Certainly, two dimensions of care and over protection/control of parental characteristics were consistently studied by factor analysis . Many decades, a commonly assessed correlation of psychiatric disorders in adolescence and adulthood has been the perceived parenting style [3,18-22], such as major depressive disorder [23,24], anxiety disorder , and suicidal behavior [1,7,26]. However, lots of literature found that, the contribution of psychiatric disorders and suicidal behaviors were not caused by solo parental characteristics of “care” or “protection” [1,3,5,22,24], it may be caused by combination of “care” and “protection” dimensions . Hence, Parker  has used two dimensions of “care” and “protection” together into four broad styles of parenting characteristics (Figure 2). Figure 2: The four quadrants of parental styles. In particular, “affectionless control” parental style, which is combined to two aspects of parental bonding of low care and overprotection, has been linked with long-term detrimental effects on the individuals’ mental health [19,20,22,24], and even elevated relative risks for a number of disorders . McGarvey et al. found youths whose parents had parental affectionless control may increase the risk of psychosocial problems, and also strongly associated with suicidal thoughts [8,27] and behavior [5,7,28]. A study indicated that the perception of maternal bonding may extremely importantly correlate to suicidal behavior . Another study suggested that providing a more caring parenting environment can be a protective factor for suicidality . Coelho et al. believed that maternal affectionless control and paternal neglectful parenting are independent contribution to the increased odds for suicidality . These inconsistent findings may be because of the different cultural background and gender of samples . Hence, parental bonding may have different outcomes in different culture. In addition, personality characteristics are also related to the risk of suicidal thoughts and behaviors . Particularly, neuroticism is increased relative risks for suicidal behavior [29,30], whereas extraversion has a negative association . Moreover, alexithymic trait is positively associated with neuroticism, while it is negatively correlated to extraversion . Chen et al. found that personality characteristics as the mediating factor between parental bonding and alexithymic trait . Furthermore, Hsu and colleagues believed that parental bonding, personality characteristics, and alexithymic trait may play a role in the risk of suicidal thoughts and behaviors . Therefore, this study explored the relationship between parental bonding aspects and suicidality, including suicidal attempt and suicidal threat, in southern Taiwan population. Moreover, the associations between personality characteristics, alexithymic trait, parental bonding and suicidality were explored in the present study. In addition, the predictive index for suicidality in Taiwanese population was also investigated in this study. 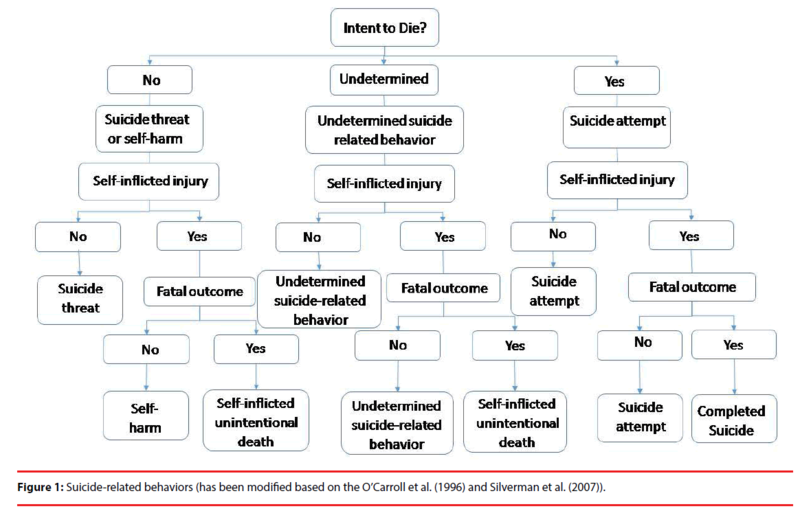 In the present study, a figure regarding the term of suicide-related behavior has been modified based on O’Carroll et al. and Silverman et al. [12,14] nomenclature (Figure 1). In our previous study, we have explored the differences between deliberate self-harm (DSH) and intent to suicide (ITS) . In the current study, only the terms suicidal threat and suicidal attempt have been enrolled, and other suicide-related behaviors have been eliminated. All participants were classified to the terms suicidal threat or suicidal attempt from the term of suicide-related behavior in Figure 1. A potentially self-injurious behavior for which there is evidence that the person probably intended to kill himself or herself. A suicidal attempt may result in death, injuries, or no injuries . A suicidal threat is a verbal or non-verbal communication that the individual intends to harm him or herself with the intention to die, but without a direct self-injurious component, and suggest that suicidal behavior might occur in the near future . The Institutional Review Board of Kaohsiung Armed Forces General Hospital approved the study in Taiwan. After detailed explanation of the purpose of the study, written informed consent was obtained from all participants. Research data was collected by self-administered questionnaires. After detailed explanation of the purpose of the research, participants signed informed consent forms and filled out the selfreport questionnaires. Total of 1077 participants were recruited in this study, which included 422 participants with suicidal attempt, 356 who’s with suicidal threat, and 299 controls. All of 778 persons with suicidal attempt or threat were informed and referred from all Health Department clinics and hospitals in 33 townships of Pingtung County in southern Taiwan. These persons with suicidal attempt or threat were received suicide care services from the homecare givers of hospital, and were invited to participate in this study. In addition, the controls were random sampling from the community in 33 townships of Pingtung County. Also, all controls have no any psychiatric diagnosis history. Suicidality and psychiatric symptoms were assessed using the five-item Brief-Symptom Rating Scale (BSRS-5), the Parental Bonding Instrument (PBI) was employed to measure the perceived quality of parental bonding, the Eysenck Personality Inventory (EPI) was used to examine the personal personality characteristics, and the 20-item Toronto Alexithymia Scale (TAS-20) was to evaluate the personal alexithymia traits. The BSRS-5 is a five item valid screening tool, which is derived from the 50-item Brief Symptom Rating Scale , for the prediction of suicidal ideation in different settings. This self-report survey requires respondents to answer whether they have felt tense, blue, irritated, inferior, had trouble falling asleep, and had any suicide ideation in the past week . An additional question, “Do you have any suicide ideation”, was added in the end of the questionnaire. These responses were rated on a five-point Likert-type scale of 0 to 4, with 0 being not at all and 4 being extremely. The optimal cut-off points of 4/5 for psychiatric patients, of 7/8 for community, and of 12/13 for general medical population, were resulted by using the receiver operating characteristic curve . The BSRS-5 has demonstrated good reliability and validity . Parental bonding is a dichotomous construct, was developed by Parker, Tupling, and Brown , which consistent of care and protection, or control. The Chinese version of the PBI was transferred and modified by Shu and colleagues . There are 12 items measuring the dimension of care and 13 items measuring protection. The rearing style of both parents is evaluated. The caring dimension refers to parental care and involvement versus rejection, and the protection dimension refers to parental control and overprotection versus promotion of autonomy. The Chinese version of the PBI has demonstrated high internal consistency (Cronbach’s alpha=0.65-0.73) and reliability (test-retest reliability=0.66-0.88) . Two scale scores of “care” and “protection” are usually negatively associated; hence, it may be appropriate to partial out any contribution made by one dimension to the different quadrants . Optimal parental bonding is described as a combination of high care and low overprotection (control), while poor parental style is composed neglectful (low care) and overly controlling (high overprotection) behaviors. 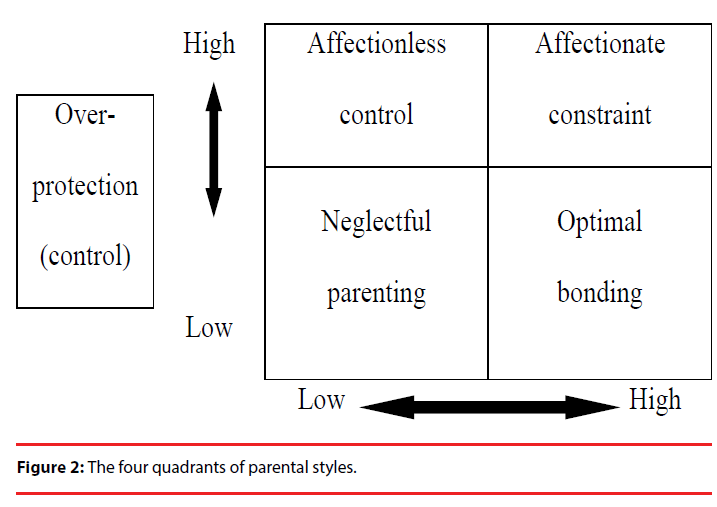 Based on these findings, styles of parental bonding classified into the four quadrants: affectionate constraint (high care and high control), affectionless control (low care and high control), neglectful parenting (low care and low control), and optimal bonding (high care and low control)  (Figure 1). The EPI, that is a 25-item self-report inventory measuring the personality characteristics of extraversion and neuroticism, was developed by Eysenck and Eysenck in 1975 . In 1994, the Chinese version was established by Lu . There are 14 neuroticism items measuring an individual’s emotional dysfunction, and 11 extraversion items measuring an individual’s sociability. Higher scores tended to reveal higher levels of extraversion and neuroticism. A Cronbach’s alpha value of 0.90 and good validity were demonstrated by Lu . The TAS-20 is a 20-item self-report inventory measuring alexithymia as a three-dimensional construct of (1) difficulty identifying feelings (DIF), (2) difficulty describing feelings (DDF) and (3) externally-oriented thinking (EOT), which means the predisposition to focus on external events rather than on one’s own inner experience . The Chinese version of the TAS-20 has shown good fit for the three-factor model, and a good internal consistency . This study used SPSS 22.0 for Windows package software (SPSS Inc, Chicago, USA) for statistical analysis and organization of the data. Descriptive analysis of demographics and regression was analyzed using SPSS, and structural equation analysis was performed using AMOS 22.0 for Windows (SPSS Inc, Chicago, USA). The cutoff point was made using the Newton-Raphson iteration to the normal controls. There were two computer programs MIX  and KMM  to decompose the normal distributed dataset, and the estimated and defined parameters (mixing proportion, means and standard deviations) of components were compared. Furthermore, the chi-square fit test was used in the structural equation modeling to investigate the overall fit of the model. Models resulting in non-significant chi-square (p values greater than 0.05 and goodness-of-fit greater than 0.9), a root mean square error of approximation (RMSEA) of 0.08 or less indicated that the model adequately described the observed data. Demographic distribution differences between suicidal attempt, suicidal threat and controls are shown in Table 1. In the first multivariate analysis mode using the hierarchical approach (Table 2), the results presented that both of the paternal and maternal affectionless control have significant associations with suicidality, after adjustment for socio-demographics. When adjusted for the demographics and depression, only the “paternal affectionless control” remained significantly associated with the outcome, with independent contribution to the increased odds for suicidality. However, the mediating factors may be neglected, hence, a further path analysis, structure equation model, is needed to explore the pathway of variables in suicidality. Table 1: Demographic distribution differences between suicidal attempt, suicidal threat and controls (N=1077). Table 2: Odds ratios for person with suicidal behaviors according to the PBI quadrant. Two structural equation models were analyzed. The first model investigated the pathway relationship of social demographics, parental bonding, personality characteristics, alexithymic traits, mental disorders and BSRS score between suicidal attempt and controls (Figure 3a). In the second model, the pathway relationship of all risk contributing factors, including social demographics, parental bonding, personality characteristics, alexithymic traits, mental disorders and BSRS score, between suicidal threat and controls (Figure 3b). In addition, the indirect effects between variables in suicidal attempt or threat are shown in Table 3. Figure 3: The pathway relationship of relative risk factors between suicidal behaviors and controls. Table 3: Regression weights estimated by SEM to demonstrate the indirect effect of each two factors in suicidal attempts or threat. Both two models showed the pathway of parental bonding affecting personality, which affects alexithymic traits, which then influences BSRS scores, thus leading to a greater tendency to develop suicidal attempt or threat. The first model, with all factors shown, resulted in an adjusted goodness-of-fit (AGFI) of .977 (greater than 0.9), RMSEA of .014 (<.080), and p value of .244 (greater than 0.05), thus showing that the model accurately described the observed data (Figure 3a). The model showed that individuals who perceived more maternal affectionless control were more likely to have neurotic traits (β=.08, p=.009). Those perceiving a higher level of paternal affectionless control were more likely to have neurotic traits (β=.19, p<.0001), and less likely to have extraverted traits (β=-.11, p=.002), and a higher degree of the alexithymic traits (β=.07, p=.021). Female tended to more likely to have neurotic traits (β=.09, p=.003). Individuals with lower level of education were more likely to have neurotic traits (β=-.17, p<.0001), and less likely to have extraverted traits (β=.16, p<.0001), and more likely to have suicidal attempt (β=-.24, p<.0001). Those with lower level of economic status were more likely to have neurotic traits (β=.07, p=.032), less likely to have extraverted traits (β=-.13, p<.0001), more likely to develop mental disorders (β=.08, p=.038), and more likely to have higher BSRS scores (β=.08, p=.015). Older persons were more likely to develop mental disorders (β=.09, p=.011), and more likely to have higher BSRS scores (β=.10, p=.002); whereas youth persons were more likely to have suicidal attempt (β=- .05, p=.040). Individuals with normal marriage were less likely to have neurotic traits (β=.13, p<.0001), and less likely to have suicidal attempt (β=.07, p=.003). Individuals live in city were more likely to have higher BSRS scores (β=-.08, p=.007), and more likely to have suicidal attempt (β=-.07, p=.002). Individuals with higher level of neurotic trait tended to have higher level of alexithymic traits (β=.54, p<.0001), and more likely to develop mental disorders (β=.27, p<.0001), and more likely to have higher BSRS scores (β=.31, p<.0001), and more likely to have suicidal attempt (β=.16, p<.0001). Those with higher level of alexithymic traits tended to have higher BSRS scores (β=.15, p<.0001), and more likely to have suicidal attempt (β=.14, p<.0001). Individuals with mental diseases were more likely to have higher BSRS scores (β=.18, p<.0001), and more likely to have suicidal attempt (β=.15, p<.0001). Lastly, individuals with higher BSRS scores were more likely to have suicidal attempt (β=.46, p<.0001). The results are shown in Figure 3a and Table 3. The second model resulted in an AGFI of .974, RMSEA of .015 and a p value of .236 (Figure 3b). This second model showed that individuals who perceived more maternal affectionless control were more likely to have neurotic traits (β=.09, p=.008), and more likely to have alexithymic trait (β=.08, p=.012). Those perceiving a higher level of paternal affectionless control were more likely to have neurotic traits (β=.09, p=.005), and less likely to have extraverted traits (β=-.08, p=.032), and a higher degree of the alexithymic traits (β=.11, p<=.0001). Female tended to more likely to have neurotic traits (β=.10, p=.003), and less likely to have alexithymic trait (β=-.09, p=.005), and less likely to have suicidal threat (β=-.07, p=.004). Individuals with lower level of education were more likely to have neurotic traits (β=-.17, p<.0001), and less likely to have extraverted traits (β=.26, p<.0001), and more likely to have alexithymic trait (β=-.18, p<.0001), and more likely to develop mental disorders (β=-.10, p=.027), and more likely to have suicidal threat (β=-.16, p<.0001). Those with lower level of economic status were more likely to have neurotic traits (β=.08, p=.019), and more likely to develop mental disorders (β=.08, p=.045), and more likely to have higher BSRS scores (β=.14, p<.0001). Older persons were more likely to develop mental disorders (β=.14, p=.001), and more likely to have higher BSRS scores (β=.17, p<.0001). Individuals with normal marriage were less likely to have neurotic traits (β=.08, p=.018), and less likely to develop mental disorders (β=.12, p=.002). Individuals living in the city were less likely to have alexithymic trait (β=.08, p=.013), more likely to have higher BSRS scores (β=-.08, p=.009), and more likely to have suicidal threat (β=-.06, p=.007). Individuals with higher level of neurotic trait tended to have higher level of alexithymic traits (β=.49, p<.0001), and more likely to develop mental disorders (β=.23, p<.0001), and more likely to have higher BSRS scores (β=.31, p<.0001), and more likely to have suicidal threat (β=.20, p<.0001). Those with higher level of alexithymic traits tended to have higher BSRS scores (β=.16, p<.0001), and more likely to have suicidal threat (β=.11, p<.0001). Individuals with mental disorders were more likely to have higher BSRS scores (β=.17, p<.0001), and more likely to have suicidal threat (β=.11, p<.0001). Lastly, individuals with higher BSRS scores were more likely to have suicidal threat (β=.49, p<.0001). The results are shown in Figure 3b and Table 3. In addition, by Newton-Raphson method, the results showed three components for the best fit in care dimension, with mean score of paternal care of 13.06 (SD=2.03), 22.09 (SD=3.41), and 30.18 (SD=4.66), respectively. Two cutoff point of paternal care were >14 and >30 (<=14, >14<=30 and >30 in three groups). The proportions of three groups in paternal care were 5%, 85%, and 10%, respectively. The mean scores of maternal care were 15.12 (SD=1.89), 22.39 (SD=2.77), and 29.46 (SD=3.65), respectively. Two cut-off point of maternal care were >17 and >27 (<=17, >17<=27 and >27 in three groups). The proportions of three groups in maternal care were 10%, 70%, and 20%, respectively. Moreover, the results showed two components for the best fit in overprotection dimension, with mean score of paternal overprotection of 3.07 (SD=1.13), and 13.41 (SD=4.92). The cut-off point of paternal overprotection were >5 (<=5, and >5 in two groups). The proportions of two groups in paternal overprotection were 10% and 90%, respectively. The mean scores of maternal overprotection were 3.77 (SD=1.27), and 14.2 (SD=4.79). The cut-off point of maternal overprotection were >6 (<=6, and >6 in two groups). The proportions of two groups in maternal overprotection were 14% and 86%, respectively. To identify the predictors of suicidal behavior may be help to improve its accurate recognition and effective prevention. Although, there are numbers of risk factors to contribute suicidal behavior, that including biological, genetic, environmental, and sociopolitical factors [1,2,13]; several studies believed poor parental bonding is strongly associated with suicidality [3-6,8,9]. Family environment has played an important role in suicidality; however, it is unknown regarding the role of paternal or maternal bonding in suicidal behavior and ideation. Hence, this study aimed to find out the relationship between different parental bonding styles and suicidality in Taiwan; moreover, the predictive index in suicidality in Taiwanese population was also explored in the present study. In the last decades, it was an argument about parenting characteristics as two-factor structure model [23,35] or three-factor structure model [16,17]. In fact, Parker  believed that used two dimensions (care and protection) together may be used to compare four quadrants of parenting style (Figure 2). Particularly, parental affectionless control (low care-high protection) quadrant presented elevated relative risks for a number of mental disorders , and it also seems as an specific predictor for suicidality [3- 6,8,9], although the literature is inconsistent in the paternal or maternal bonding. Similar to the previous studies [9,43], the findings in the present study, parental affectionless control presented as a predictor in both suicidal attempt and threat, in particular, “paternal affectionless control” showed stronger associated with a specific contribution to the increased odds for suicidality (Table 2). In the multivariate analysis mode using the hierarchical approach (Table 2), the results presented that paternal affectionless control has increased the relative risk for suicidality 2.13-fold, and maternal affectionless control has increased the relative risk for suicidality 1.54-fold. After adjustment for socio-demographics, paternal affectionless control has increased the relative risk for suicidality 2.21-fold and maternal affectionless control has increased the relative risk for suicidality 1.6-fold. However, when adjusted for the demographics and depression, only the “paternal affectionless control” remained significantly associated with the outcome, with increasing the relative risk for suicidality 1.8-fold. One problem need to consider, suicidal is related to depression [2,8]. Hence, the mediating effect of depression would be disappeared, while adjusted for the depression in this multivariate analysis model. Thus, a further path analysis, structural equation model, would be analyzed the mediating role of depression in suicidality in next stage. Lots of previous studies have resulted affectionless control as a specific risk factor for suicidality, especially in “maternal affectionless control” [4,8,26,28,44-47]. However, “paternal affectionless control” presented a stronger association with suicidality in this study. A possible explanation may be the cultural effect. In the traditional Chinese society, father plays a more restricted role, however, the gender equality has appear in Today, the role of father and mother may be exchange in modern society in Taiwan. In addition, a number of limitations also need to consider and discuss for the above previous studies [4,26,28,44,45], such as small size, lacking of control in gender differences, recall bias,selection bias, cultural differences, lacking of level of mental disorder (minor or major), and insufficient of clear definitions in suicidal attempt and suicidal threat . Moreover, there is also no any evidence to verify the cut-off point of parental bonding in suicidality in the previous studies. Obviously, by structural equation model, neuroticism, extraversion, and alexithymic trait are linked to the risk of suicidal attempt and threat (Figure 3a and 3b). Also, those risk factors are associated to BSRS scores and developing of mental disorders. Moreover, the models presented that personality characteristics and alexithymia as the mediating factors between parental affectionless control and suicidal attempt or threat. In addition, number of demographics, such as age, gender, education, economic status, marriage, and residential area (city or town), also resulted elevated relative risks for suicidal attempt or threat. Interestingly, youth persons tend to more likely to have suicidal attempt, and persons with normal marriage tend to less likely to have suicidal attempt. Similar to the previous study , persons who were younger, were more likely to develop intention to suicide behavior, especially adolescents have highest risk in suicidality in Taiwan [46-48]. Conversely, suicide attempters were older and had a longer duration of illness . The possible explanation may be the ethnic differences, and participants’ characteristics. On the other hand, females tend to less likely to have suicidal threat. This finding is similar to the previous studies [2,50], suicidal ideation was more prevalent in female and depression. In fact, male suicide mortality was higher than the rate of female suicide mortality. The gender differences in suicide mortality and suicidal threat may be contributed to the prevalence of depression , and gender role and position of female in Chinese culture . In the present study, the optimal parenting style for suicidal attempt or threat is defined as a combination of the highest care and lowest overprotection of both parents. The persons who belonged to optimal parenting tend to the lowest prevalence of suicide attempt or threat. Using the Newton-Raphson method, the cut-off points for paternal and maternal overprotection scores were 5 and 6 points, respectively. The cut-off points of paternal and maternal care were 14 and 30 points, 17 and 27 points, respectively. Scores higher than the cut-off points were defined as “high”, while scores equal or below the cut-off points were defined as “low” in the current study. There is no difference between paternal and maternal overprotection on mean, proportion and cut-off points, however, the dimension of care is very different. In fact, several areas of parental attachment may overlap with expressed emotion (EE), such as involvement and criticism . Parents with high levels of criticism or over-involved EE might place children at risk of poor mental health or antisocial behavioral problems , and could related to some symptoms of psychological distress [20,32]. Also, it is suggested that low levels of EE is associated to symptomatic recovery, like Eating Disorder and depressive symptoms . Hence, it is believed that parental high levels of EE might relate to psychotic episodes, but also associate to neuropsychological symptoms; and it may consider in future studies. This study find out the parental styles of paternal and maternal “affectionless control” are early predictors of suicidality in our population in Taiwan. Particularly, paternal affectionless control seems to play a more significantly important role in suicidal threat and attempt in Taiwan population. Also, the cut-off points for paternal and maternal overprotection scores were 5 and 6 points, respectively. The cut-off points of paternal and maternal care were 14 and 30 points, 17 and 27 points, respectively. These cutoff points for parental styles could be provided a reference in detection for suicidality. This index may also use in clinical treatment and health care, especially in early prevention. Moreover, personality characteristics, alexithymia, and mental disorders present as the mediating factor for parental affectionless control and suicidality. Obviously, both of suicidal threat and attempt seem have significantly affected by predisposing factors, however, the impact of paternal affectionless has especially contributed to suicidal attempt through neuroticism than threat (Table 3). These models may be provided the references for clinical implication and further suicide preventive strategies. Different preventive program and model might be considered in different type of suicide behaviors. The authors would like to acknowledge all researchers who assisted in this study. All authors have no conflict of interest to declare. Lung FW. Diathesis, psychopathology, resilience, and suicidality. Taiwanese J. Psychiatry27(1), 175-182(2013). Yen YC, Yang MJ, Yang MS, et al.Suicidal ideation and associated factors among community-dwelling elders in Taiwan. Psychiatry.Clin.Neurosci59(4), 365-371(2005). Coelho FMC, Pinheiro RT, Silva RA, et al.Parental bonding and suicidality in pregnant teenagers: a population-based study in southern Brazil. Soc. Psychiatry.Psychiatr.Epidemiol49(8), 1241-1248(2014). Freudenstein O, Zohar A, Apter A, et al. Parental bonding in severely suicidal adolescent inpatients. Eur. Psychiatry26(8), 504-507(2011). Goschin S, Briggs J, Blanco-Lutzen S, et al.Parental affectionless control and suicidality.J. Affect.Disord151(1), 1-6(2013). Heider D, Bernert S, Matschinger H, et al.Parental bonding and suicidality in adulthood. Aust. N. Z. J. Psychiatry 41(1), 66-73 (2014). Hsu YF, Chen PF, Lung FW. Parental bonding and personality characteristics of first episode intention to suicide or deliberate self-harm without a history of mental disorders. BMC. Public. Health13(1), 421-428 (2013). Martin G, Waite S. Parental bonding and vulnerability to adolescent suicide. Acta.Psychiatr.Scand89(4): 246-254 (1994). McGarvey EL, Kryzhanovskaya LA, Koopman C, et al.Incarcerated adolescents’ distress and suicidality in relation to parental bonding styles. Crisis 20(4), 164-170 (1999). Nock MK, Borges G, Bromet EJ, et al.Cross-national prevalence and risk factors for suicidal ideation, plans and attempts. Br. J. Psychiatry192(2), 98-105 (2008). Shneidman ES. The definition of suicide. John Wiley and sons, New York, NY and London (1985). Silverman MM, Berman AL, Sanddal ND, et al.Rebuilding the tower of Babel: A revised nomenclature for the study of suicide and suicidal behaviors. Part 2: Suicide-related ideations, communications, and behaviors. Suicide. Life. Threat.Behav37(3), 264-277 (2007). Gvion Y, Apter A. Suicide and suicidal behavior. Public. Health. Rev34(2), 1-20(2012). Silverman MM, Berman AL, Sanddal ND, et al.Rebuilding the tower of Babel: A revised nomenclature for the study of suicide and suicide behaviors. Part 1: Background, rationale, and methodology. Suicide. Life. Threat.Behav37(3), 248-263 (2007). O’Carroll PW, Berman AL, Maris RW, et al.Beyond the tower of Babel: A nomenclature for suicidology. Suicide. Life. Threat.Behav26(), 237-252 (1996). Hinde RA. Towards understanding relationships. Academic Press, London (1979). Murphy E, Brewin CR, Silka L. The assessment of parenting using the Parental Bonding Instrument: two or three factors? Psychol. Med27(2), 333-342 (1997). Parker G. The measurement of pathogenic parental style and its relevance to psychiatric disorder. Soc. Psychiatry 19(2),75-81(1984). Enns MW, Cox BJ, Clara I. Parental bonding and adult psychopathology: results from the US National Comorbidity Survey. Psychol. Med32(6), 997-1008(2002). Lung FW. Developmental aspects of parental attachment and mental health in structural equation modeling. Taiwanese. J. Psychiatry.25(2), 63-75(2011). Murphy E, Wickramaratne P, Weissman M. The stability of parental bonding reports: a 20-year follow-up. J. Affect.Disord 125(1-3), 307-315(2010). Overbeek G, ten Have M, Vollebergh W, et al.Parental lack of care and overprotection. Longitudinal associations with DSM-III-R disorders. Soc. Psychiatry.Psychiatr.Epidemiol42(2), 87-93(2007). Parker G. Parental “affectionless control” as an antecedent to adult depression: a risk factor delineated. Arch. Gen. Psychiatry40(9), 956-960 (1983). Patton GC, Coffey C, Posterino M, et al.Parental “affectionless control” in adolescent depressive disorder. Soc. Psychiatry.Psychiatr.Epidemiol36(10), 475-480(2001). Heider D, Matschinger H, Bernert S, et al. Adverse parenting as a risk factor in the occurrence of anxiety disorders: a study in six European countries. Soc. Psychiatry.Psychiatr.Epidemiol43(4), 266-272(2008). Kovess-Masfety V, Boyd A, Haro JM, et al.High and low suicidality in Europe: A fine-grained comparison of France and Spain within the ESEMeD surveys. J. Affect.Disord133(1-2), 247-256(2011). Adam KS, Keller A, West M, et al.Parental representation in suicidal adolescents: a controlled study. Aust. N. Z. J. Psychiatry 28(3), 418-425(1994). Dale R, Power K, Kane S, et al.The role of parental bonding and early maladaptive schemas in the risk of suicidal behavior repetition. Arch. Suicide. Res14(4), 311-328(2010). Gau SSF, Lai MC, Chiu YN, et al.Individual and family correlates for cigarette smoking among Taiwanese college students. Compr. Psychiatry50(3), 276-85(2009). Voracek M. Lack of association between digit ratio (2D:4D) and assertiveness: replication in a large sample. Percept. Mot. Skills109(3),757-769(2009). Bermond B, Vorst HCM, Vingerhoets AJJM, et al.The Amsterdam Alexithymia Scale: its psychometric values and correlations with other personality trait. Psychother.Psychosom.68(5), 241-251(1999). Chen PF, Chen CS, Chen CC, et al.Alexithymia as a screening index for male conscripts with adjustment disorder. Psychiatr. Q 82(2), 139-150(2011). Lee MB, Liao SC, Lee YJ, et al.Development and verification of validity and reliability of a short screening instrument to identify psychiatric morbidity. J.Formos. Med.Assoc102(10), 687-694(2003). Lung FW, Lee MB. The five-item Brief-Symptom Rating Scale as a suicide ideation screening instrument for psychiatric inpatients and community residents. BMC. Psychiatry8(1), 53-60(2008). Parker GH, Tupling H, Brown LB. A Parental Bonding Instrument. Br. J. Med.Psychol52(1), 1-10(1979). Shu BC, Lo WJ, Lung FW. The reliability and validity of Parental Bonding Instrument in Chinese version. Nurs. Res. Taiwan7(1), 479-489(1999). Eysenck HJ, Eysenck SBG. Manual for the Eysenck Personality Questionnaire. Hodder and Stoughton, London(1975). Lu L. University transition: Major and minor life stressors, personality characteristics and mental health. Psychol. Med24(1), 81-87(1994). Taylor GJ. The alexithymia construct: conceptualization, validation and relationship with basic dimensions of personality. New. Trends. Exp.Clin. Psychiatry10(2), 61-74(1994). Lin YC, Chan CH. A factor analysis of the Taiwan version of the Toronto Alexithymia Scale-20. Taiwanese. J. Psychiatry 17(1), 276-282(2003). Macdonald PDM, Pitcher TJ. Age-groups form size-frequency data: a versatile and efficient method of analyzing distribution mixtures. J. Fish. Res. Board. Can36(8), 987-1001(1979). Malachlan GJ, Basford KE. Mixture Models: Inference and Applications to Clustering. Marcel Dekker, New York(1988). Miller KE, King CA, Shain BN, et al.Age-groups form size-frequency data: a versatile and efficient method of analyzing distribution mixtures. Suicide. Life. Threat.Behav22(1), 226-239(1992). Diamond GM, Didner H, Waniel A, et al.Perceived parental care and control among Israeli female adolescents presenting to emergency rooms after self-poisoning. Adolescence 40(158), 257-272(2005). Goldney RD. Parental representation in young women who attempt suicide. Acta.Psychiatr.Scand72(3),386-395(1985). Lai KW, McBride-Chang C. Suicidal ideation parenting style and family climate among Hong Kong adolescents. Int. J.Psychol36(2), 81-87(2001). Yamaguchi N, Kobayashi J, Tachikawa H, et al.Parental representation in eating disorder patients with suicide. J.Psychosom. Res49(2), 131-136(2000). Department of Health Executive Yuan, Taiwan. Profile of the Taiwan region: 10 leading causes of death structured by age. 2006 death statistics results summary, Taiwan. Retrieved September 15, 2015, from: (2006). Favaro A, Santonastaso P. Suicidality in eating disorders: clinical and psychological correlates. Acta.Psychiatr.Scand95(6), 508-514(1997). He ZX, Lester D. Elderly suicide in China. Psychol. Rep89(3),675-676(2001). Warner R, Atkinson M. The relationship between schizophrenic patients’ perceptions of their parents and the course of their illness. Br. J. Psychiatry153(1), 344-353(1988). Caspi A, Moffitt TE, Morgan J, et al.Maternal expressed emotion predicts children’s antisocial behavior problems: using monozygotic-twin differences to identify environmental effects on behavioral development. Dev.Psychol40(2), 149-161(2004). Hedlund S, Fichter MM, Quadflieg N, et al.Expressed emotion, family environment, and parental bonding in bulimia nervosa: A 6-year investigation. Eat. Weight.Disord8(1), 26-35(2003). Joiner TE (2005) Why people die by suicide. Harvard University Press, Cambridge, MA, USA.